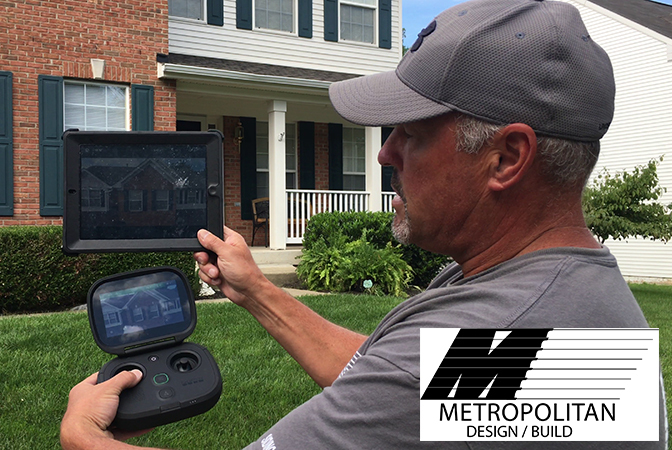 At Metropolitan Design/Build, we are utilizing high-tech technology to improve our roof inspections by incorporating “Drone Imaging”. With the advancements in drone and high-resolution 4K video, we can perform roof inspections quickly at most locations from the safety of the ground. Our expert roof inspectors now can view your roof and all its components with the use of a drone while homeowners watch live footage on an Apple iPad! A drone roof inspection allows for a faster and safer method of inspecting your home’s roof to get the birds-eye view from the air. We can quickly identify the overall condition of all the roofing systems — quickly identify missing shingles, the condition of ridge vents, flashing, vent pipe conditions, skylights, chimneys, gutters and even your siding all from the safety of the ground. Capturing the whole event so that it can be referred to later. 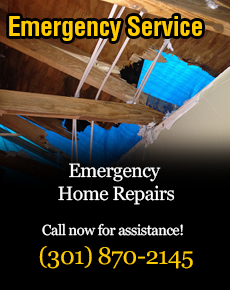 Many times, a roof inspection is performed by a single roof inspector and there are serious risks involved in climbing ladders and moving around on a rooftop, not to mention the possibility of damage to your home while performing an inspection. Drones allow us to take advantage of the current technology that eliminates the need for inspectors to physically get on a roof for inspection. Many of our customers are pleased with the ability to see what our inspectors are seeing as the roof inspection is taking place. Pictures are great but live video is even better! We don’t charge extra for a drone inspection of your roof like many other roofing contractors. We use the drones when it is safe to do so and if they can fly in your area. 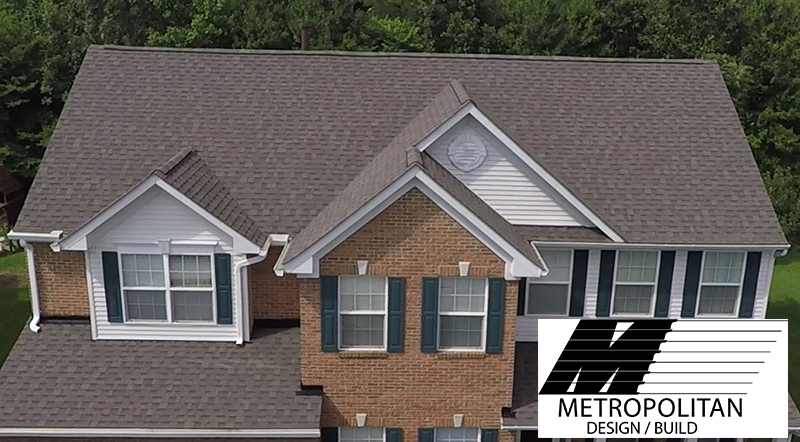 Our quick adoption of the latest high-tech technology is just another way Metropolitan Design/Build sets itself apart from other roofing contractors and leads with innovative methods. 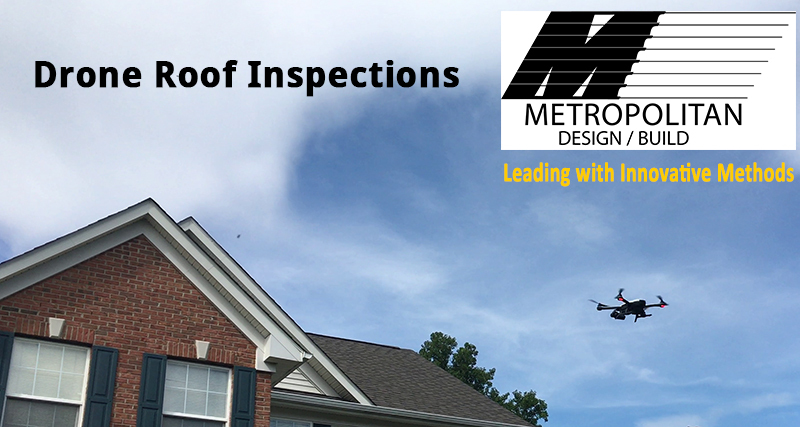 To schedule, a drone roof inspection you can contact Metropolitan Design/Build by calling (301) 870-2145 or by completing our online form on this page.